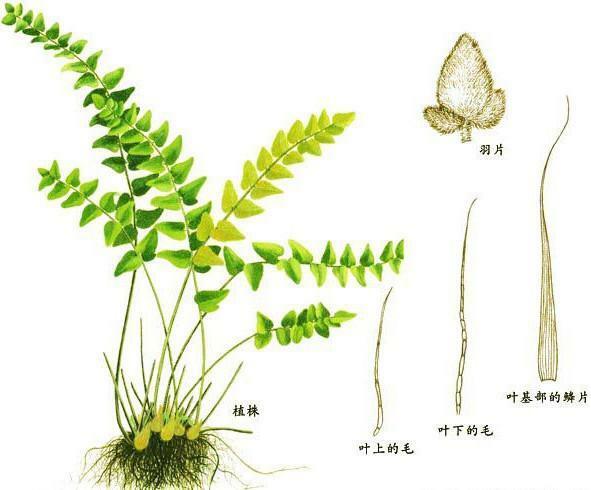 The drug is the dried whole plant of Gymnopteris bipinnata Christ var. auriculata (Fr.) Ching (family Hemionitidaceae), growing on dry rocks, distributed in Liaoning, Hebei, Henan, Shandong, Shanxi, Shaanxi, Gansu, Hubei, Sichuan, Yunnan of China. Remove toxicity, dry dampness and relieve itching. Eczema, abnormal leucorrhea, sores and itch caused by wind toxin. Decoct 9~15 g of the root. Proper dosage is for external application, decocted for washing with the whole herb.